I am a man of simple pleasures. I am the kind of guy who goes to work, goes to school, and then spends his off time watching cats on YouTube and flicking paperclips across his desk as a leisurely activity. It was during one of these sessions of simultaneous clip-flicking and cat-watching that I was met with an odd request; to revive an old column I used to write in the high school paper for an up-and-coming local news blog. Despite my stuffed schedule, I agreed, and put off hours of cat videos to write this column for all you lucky readers. So back in high school my column in the school paper was about bands that people may not have known about, or had stayed off the public radar for far too long. However, after finishing high school, my musical tastes began to slowly change to where I was hard pressed to find anything in my library that would appeal to a well-adjusted human being. I couldn’t find anything, but I found the next best thing. So let’s stop dragging out this intro and talk about some music! So for the Debut of the Reboot of the Remake of the Reformatting of my high school journalistic love child, I decided I’d write about a band that, while they may not have widespread appeal and definitely won’t be everyone’s cup of tea, at least does something different and interesting and in that respect deserves some recognition. 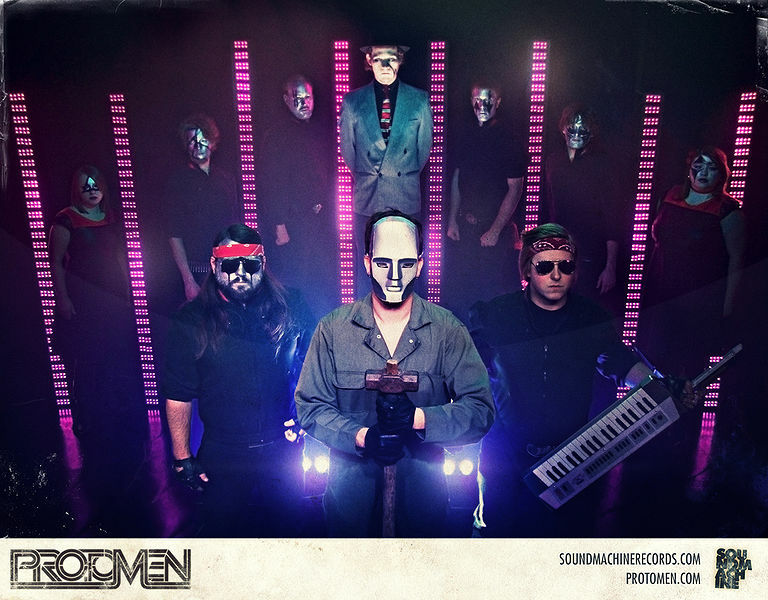 The Protomen are a band of men and women hailing from the rock and roll capital of the world; Murfreesboro, Tennessee. The band was formed by a group of graduates from the recording program at Middle Tennessee State University, seeking to do something that went completely against everything they had been taught in their classes. Their musical style is difficult to really pin down and describe. The band is, at its core, a rock opera, but to describe them simply as that would be to do them an injustice. While the music does tell a story and there are operatic choirs involved in many songs, the bands also takes a lot of influence from chiptunes, punk, ’80s pop, old country, and even ska. Normally when a band tries to throw together so many genres, things tend to become messy and fall apart, but The Protomen somehow managed to make it work, with no element of their music ever feeling shoveled in or out of place. It all just seems to fall together into a perfect smörgåsbord of good times for your earholes. However, with a band such as this, the sound they make is not the only element of their music, but also the words they speak. As previously mentioned, the Protomen’s music tells a story, and a surprisingly well done story at that. As some of you with puncture wounds in your palms from years of gripping the sharp corners of a sweat covered NES controller may have extrapolated from the band’s name, the story is about a certain blue robot you may be familiar with. Yes, the story is an alternate take on the classic “Megaman” story, but given the lack of story present in the “Megaman” games themselves (Evil scientist builds evil robots, defeat evil robots and then scientist, lather, rinse, repeat), the band gives the family friendly android a darker edge, by swapping the colorful world of the games for an Orwellian dystopia, with some elements of Atlas Shrugged peppered on top for good measure. While perverting the worlds of something considered safe and family friendly may be considered cliché by some at this point, in this case it still manages to work into a fairly compelling story of betrayal, intrigue, doubt, and hope, which is really brought to life by the performances of the bands singers in such songs as “The Will of One,” “The Stand (Man or Machine),” “The Hounds,” and “The State vs. Doctor Light”. The earnest and powerful delivery by the band’s main singers, Raul Panther, The Gambler, and Turbo Lover (yes, the whole band goes by stage names), are what really give legs to this story. I’m not going to go into the details of the story itself, just take my word for it that it’s, at the very least, well told. If you like what you hear, I would absolutely recommend trying to go and see them live. I recently had the privilege of seeing these guys in concert in Anaheim, and I can say their performances are definitely a spectacle you cannot afford to miss. The Protomen truly do sound better live than they do on the albums, and with the theatrics, humor, and the ability to really work a crowd into a frenzy, they truly do light up the night.